All it took was a customer seeing our bat-inspired “Austins, Texas, USA” poster up close at a pop-up, shrugging and saying, “What if it didn’t say Austin? 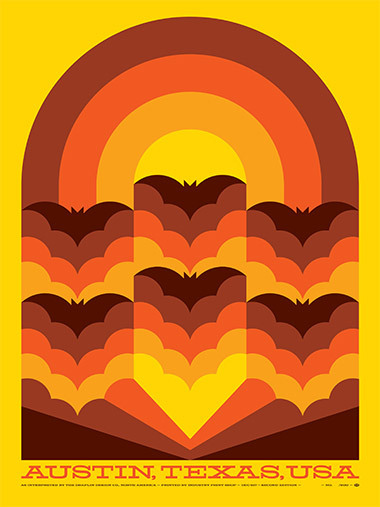 I love bats, and love Austin, but I live here in Portland!” Well, right. Exactly. A light bulb when off in my head. And that light bulb was dripping with fresh guano. So I whipped up some colors and that’s what you are seeing here. Check that deep purple color, right? HELL FREEZES OVER. Bats rising! These things are BEAUTIFUL. Printed so well, and we thank Nick at Seizure Palace for that killer registration. Bright as hell! Dip me in guano! 02. Four colors! Inspired by Halloween colors. 04. Proudly printed by our guano-dipped buddies at Seizure Palace! 06. Dedicated to all the bats out there. Hanging, shitting, flying and dive-bombing. 08. Guano-dipped limited edition of 200. 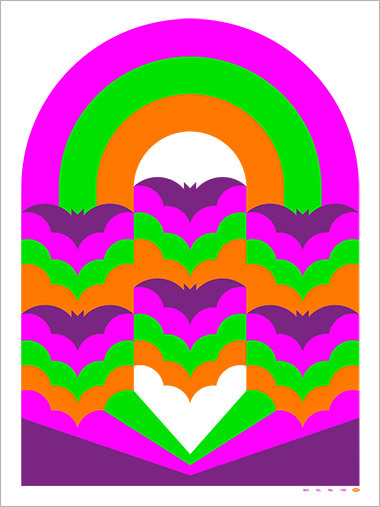 Today, like bats from underneath a bridge, we unleash our “Austin, Texas, USA” poster! Now flapping! 01. Printed on thick, durable French Paper Co. “Lemon Drop” Pop-Tone 100# cover stock! 02. Four colors! Inspired by Austin heat. 04. Proudly printed by our Austin buddies at Industry Print Shop! 06. Dedicated those bats under that bridge.